MANILA, Philippines - Pop superstar and "X-Factor' judge Britney Spears' wish to learn the now famous "Gangnam Style" dance has finally come true. Last Aug. 29, Spears tweeted that she loved the music video of Korean rapper and YouTube sensation Psy and wanted to learn the choreography. "I am LOVING this video - so fun! Thinking that I should possibly learn the choreography. Anybody wanna teach me?! haha," she wrote along with a link to "Gangnam Style." Today, Spears got her dance lesson from Psy himself when she and Simon Cowell appeared as guests on the "Ellen" talk show to promote "X-Factor." During the interview, Ellen DeGeneres told Spears and Cowell that she danced to "Gangnam Style." "This video is blowing up all over the place," DeGeneres said. "It's brilliant," said Simon Cowell. "He's fantastic, isn't he?" said Ellen. Ellen then told Spears, "So I got somebody here to teach you that dance. Psy come on out!" Psy appeared and then taught Spears and DeGeneres the famous "Gangnam Style" horse dance. A day before Spears' appearance on the show was aired, Ellen tweeted, "Wait 'til you see #BritneyDoingGangnam Style w/Psy on my show tomorrow." 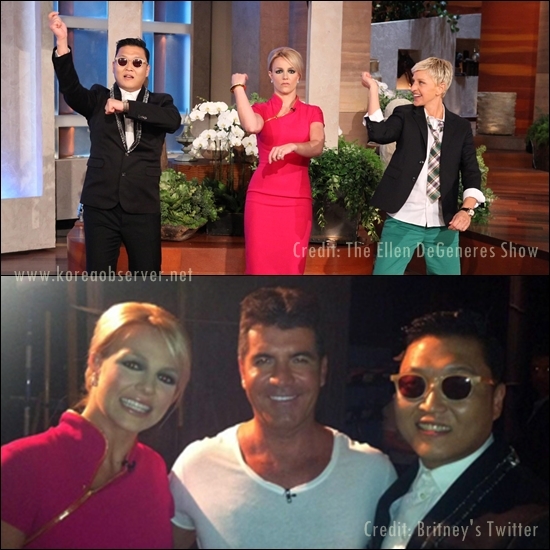 After the show was aired, Spears posted a photo on Twitter of her with Psy and Cowell. "@TheEllenShow and I learned how to go Gangnam style from the master today! @psy_oppa #BritneyDoingGangnam," she wrote. "Gangnam Style" has racked up 144 million views on YouTube. Psy flew to the US last week to attend the MTV Video Music Awards. Since then, he has been doing the rounds on various radio and TV shows in the US because of his new fame. Before "Ellen," Psy was interviewed by "American Idol" host Ryan Seacrest on the latter's syndicated radio show "On Air with Ryan Seacrest."